It’s not often that early childhood stories make the front page of the New York Times. 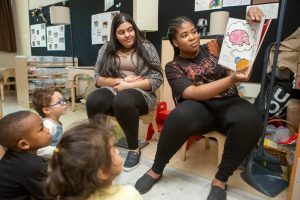 But this week, the paper featured an article by Jason DeParle about Head Start, a federal early childhood program that serves nearly 900,000 low-income children, and how the quality of the program has improved over the past several years. DeParle’s article is a great example of journalism that moves past the common (and relatively useless) question of “does Head Start work?” and goes deeper into exploring how the program has improved its practices, including changes related to coaching, teacher preparation and quality, use of data, and the Designation Renewal System (all of which Bellwether has studied and written about previously). This type of reporting contributes to a more productive conversation about how to create high-quality early learning opportunities for all children that can inform changes to early childhood programs beyond Head Start. Courtesy of Allison Shelley/The Verbatim Agency for American Education: Images of Teachers and Students in Action. As DeParle points out and the data clearly show, while there is wide variation between individual programs, overall the quality of teaching in Head Start is improving. But while this trend is undoubtedly positive, it raises some questions: What effect will these changes ultimately have on children’s academic and life outcomes? And what can Head Start programs do to their program content and design to even better serve children? Next month, Bellwether will release a suite of publications that tries to answer those questions. We identified five Head Start programs that have evidence of better-than-average impact on student learning outcomes and thoroughly examined these programs’ practices to understand how they contributed to their strong performance. I visited each program, conducted in-depth interviews with program leadership and staff, reviewed program documents and data, hosted focus groups with teachers and coaches, and observed classroom quality using the Classroom Assessment Scoring System, CLASS (the measure of teaching quality on which DeParle notes Head Start classrooms nationally have shown large quality improvements). By better understanding the factors that drive quality among grantees and identifying effective practices, we hope to help other programs replicate these exemplars’ results and advance an equity agenda. As the New York Times front page recently declared, Head Start’s progress offers a ray of hope in a dysfunctional federal political landscape. But there is still room for progress. Looking at what high-performing programs do well can help extend the reach and impact of recent changes to produce even stronger outcomes for young children and their families. This entry was posted in Accountability, Early Childhood Education, Education Policy, Equity, Evaluation, Federal Education Policy, Politics of Education, Research and tagged bipartisan, Class, early childhood, federal policy, Head Start, Jason DeParle, New York Times, parents, preschool on February 8, 2019 by Ashley LiBetti.